MAY THE CHILDREN’S ROSARY, THEIR FAMILIES, THOSE ASSOCIATED WITH THE CHILDREN’S ROSARY INCLUDING OUR PRIESTS, OUR BISHOP AND OUR HOLY FATHER THE POPE BE THE EXTENDED HANDS OF OUR BLESSED MOTHER AND HER SON. MAY WE GATHER A GREAT MANY SOULS ESPECIALLY YOUNG PEOPLE FOR THE LORD. MAY WE EXPERIENCE RENEWAL OF FAMILY PRAYER AND SPREAD IT ACROSS THE GLOBE. IN A SPECIAL WAY WE ASK EACH SAINT TO CHOOSE AN INDIVIDUAL, FAMILY OR A PRIEST, ASSOCIATED WITH OUR CHILDREN’S ROSARY GROUP TO LEAD IN THEIR SPIRITUAL JOURNEY. DEAR SAINT PRAY FOR OUR EXTENDED GROUP THAT WE MAY EMBODY THE VIRTUES YOU EXEMPLIFIED HERE ON EARTH. 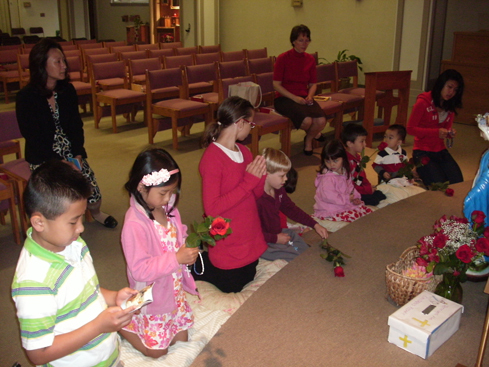 To become a member of the Children’s Rosary one only has to tell the Lord in their heart of their desire to be a part of our group. You will then be included in all the novenas being said and all of the rosaries being prayed daily. A nine day novena has been completed for all the Saints listed below. Eight hundred and twenty Saints have been invited to join the Children’s Rosary. We plan to continue until all Saints and Blesseds in Heaven are members. If you would like to add a Saint, Blessed, Venerable or Servant of God to our list please pray a 9 day novena for the intention above. Let us know of your novena and the Saint’s name and it will be added to our list! Thank you so much. We are so grateful for the prayers!